BSF troops deployed at Baghmara in South Garo Hills District of Meghalaya seized four rafts of wooden logs from the river Simsang. Among the seized logs, 78 pieces of logs measuring 267 Cft of wood worth more than Rs. 10 Lacs on international border were being smuggled to Bangladesh through Simsang river.Due to rise in water level in river Simsang, smugglers are exploiting the flow of river towards Bangladesh for smuggling forest wood. 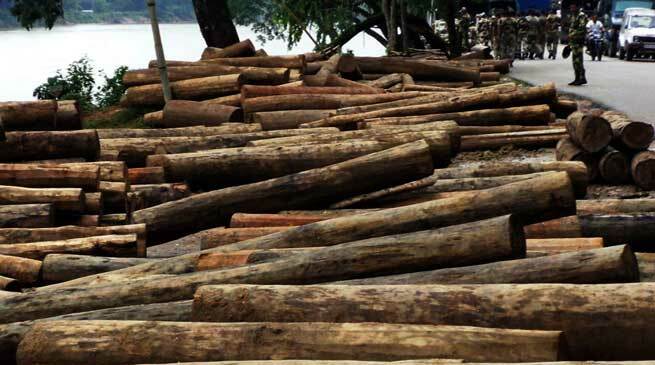 Wooden logs concealed under the bamboo rafts are seized frequently from the flooded rivers/nullahs in Meghalaya. The BSF troops had to toil physically and mentally in order to drag these rafts out of the river as over flooded water bodies pose threat to life also. BSF troops being committed to ensure any infiltration from across the border need exert heavily to pull these heavy logs from river without help of forest department. Even the evaluation of these seized logs takes too much of time in absence of forest representative. Despite of regular seizure by BSF at zero line this smuggling of wooden logs continuing unabated from hinterland. In an another incident BSF troops deployed at Tuka and Omkhawa under East Khasi Hills district seized 80 bottles of liquor while being smuggled to Bangladesh. Sensing the presence of the BSF troops, smugglers fled the spot taking advantage of darkness and rainy weather. BSF troops are keeping a regular vigil to foil any such attempt and have succeeded to make seizure of huge wooden. The seized items have been handed over to concerned department for further disposal.